I liked to visit the shrine and the temple since I was young. Fortunately since my family was involved in carpenter works and had archtectural and wood processing techniques, I could make small shrines in a hobby sense. Such shrines were basically made by apprentices with a direction of their boss in the past. However recent carpenters build houses just using the materials supplied by house makers in most cases and, therefore, they have less opportunity to make something light-heartedly using the materials they have. Thinking of the fact that the number of shrine manufacturers has decreased, I came to handle shrines on a commercial basis in the name of ATELIER Daigoro. I have seen an increasing demand of customers who want to renew the shrine where a god lives at the same time when currently used main house is rebuilt. However making only one shrine would eventually become costly because of resulting waste and labor cost if it is made by the carpenters who are solely involved in building living houses. Building firms and house makers, therefore, come to ATELIER Daigoro for ordering shrines. The aterier is able to manufactures shrines at a lower cost without resulting waste and additional labor cost because it is extensively engaged in manufacturing shrines. I am proud of this job which makes everyone feel happy because I can get orders through introduction, building firms can save trouble and customers can get high quality shrines at a low cost. Besides, ATELIER Daigoro handles universal pothooks. Pothooks are used being hung above hearthes. They are made of natural materials which are found scouting and hand-worked. There is neither the same product exists in the world, nor the same product can be made accordingly. The product emerges from a log after being processed through combination of a hand feeling and a natural wood. Particularly the most exiting in the job is skiving a log into a fish statue (a horizontal piece) which is to be attached to the upper side of the hook. In the past, businessmen's houses and large farmhouses had a culture that a shrine was built in their gardens with a spirit brought from the nearby main shrine. However, there are few houses which have a shrine nowadays. Thinking of this, shrine business may be tapered in the future. The number of craftsmen in this line has decreased, lesser than the tapering business. Craftsmen show tendency to make magnificent larger size shrines. Since they can demonstrate their skill if they make such larger size buildings. They may be able to get self-satisfaction and they also find pleasures in making. Surprisingly there are very few people who make simple shrines. It would be a lie if I say I do not want to make such magnificent shrines. However, there are some who want simple and reasonably priced shirines, too. Furthermore, if I make elaborate products, it absolutely takes time and I may not be able to accept other orders while making them. Output ability is limited because I am alone to do everything for shrines, hearthes and universal pothooks. I should be honest in doing what I can do within the capacity and should comply with customer's requirements right before me. Realizing a role given to me, I am engaged in making articles. 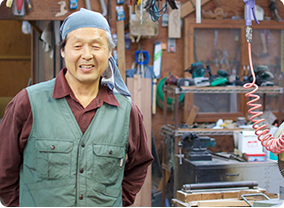 He is engaged in making Japanese traditional buildings such as shrines, hearthes, universal pothooks, etc., making good use of wood processing technique attained through carpenter works. Structures made through technical combination of wood processing, sheet metal work, painting and/or sculpturing also available. Uruido 2661, Hasuda City, Saitama Pref.